In 1825 a great project was begun that would open up the entire state of Ohio to transportation and trade. The Ohio frontier would be connected via a canal waterway with New York and New Orleans. The Ohio & Erie Canal helped people and products flow across America, fueling westward expansion and trade. Extending 309 miles from Lake Erie to the Ohio River, the Ohio & Erie Canal completed a water route between the East Coast and the Gulf of Mexico. It was basically the ‘ditch” that opened up Ohio’s wilderness. The Ohio & Erie Canal took 7 years to complete and was finished in 1832. With the growth that was stimulated by the canal, Ohio’s population grew from 581,295 in 1820 to 1.98 million in 1850. This made Ohio the third most populous state in the union. Cities such as Akron and Cleveland, grew from small towns into prosperous communities bolstered by the passengers and trade on the canal. There were some famous people who worked and traveled the area canals. As a teenager in 1847, James Garfield worked as a helmsman, driving horses to pull barges along the canal. After repeatedly falling into the canal on the job, Garfield became ill, and decided to go to college instead. He later became the 20th President of the United States but died after serving only 6 months of his term. Today, the Ohio & Erie Canalway is a National Heritage Area. It is a scenic area with trails, scenic by ways and trains. There are winding rivers and lakes, and rustic wooded areas. Ohio's history almost comes to life around you as you travel the route the early "canawlers" used to transport their goods and passengers. The trail meanders through scenic areas like the Cuyahoga Valley National Park, cities like Akron and Massillon that were once major ports along the canal, and small towns like Canal Fulton and Peninsula whose size today belies their importance in the early days of the canal and who owe their very existence to the canal It’s a beautiful part of Ohio’s history but was also the scene of darker times and tragic accidents. Tales of unmarked graves, Indian attacks, accidental drownings and ghostly apparitions linger along the canal and its towpath. During construction of the canal, many workers of Irish ethnicity were hired for the strenuous project. Thousands upon thousands labored to build the canals. Those literally in the trenches faced extremely arduous conditions for little pay. The workers lived on the edge of subsistence financially; physically, canal work was back breaking, dangerous, and at certain times fraught with the near certainty of cholera and malaria, which carried off sizable chunks of the work force during virulent years. The lives of many Irish immigrants who worked in the canals seem to have been, in those immortal words, "short, brutish, and nasty", violence and heavy drinking were rampant in the communities, and armed conflicts and labor riots were far from unheard of during these early years. In digging the canal, mud, dirt and trees were moved by back breaking work with only picks, axes, and shovels as the tools of the time period. Horses and mules were also used to haul soil and felled trees but the men bore the brunt of the physical labor. Workers were typically paid 30 cents per day with a jigger or two of whiskey to help stave off any diseases. Unfortunately, antibiotics were not invented yet and many hardened workers succumbed to the ravages of diseases such as cholera, dysentery and malaria. Poor living conditions helped the spread of vermin and disease as did poor quality drinking water. Cholera was spread through contaminated water but it was not a known fact at this time. The Scots Irish seemed to suffer the most. The local legend that surrounds the canal says that for every mile of canal, a dead Irishman lies buried in its banks. The poor souls who perished could not afford proper burial in many area church yard cemeteries as they had no funds to pay for decent burials. Many a lone worker fell dead and was simply buried in a shallow grave dug along the steep banks of the canal. It is said that in life we seek acknowledgment and in death we seek the same. If a grave is not acknowledged or marked properly, many believe that the soul does not rest as it should. Could this be what fuels the paranormal activity among the old towpath and canal? If the legend is correct, and there is at least one body for every mile of canal, then there would be at least 300 bodies in unmarked graves along the towpath trail. Many local Native American Indians were displeased with the canal way and the encroaching settlers. The canal business was subject to a few Indian raids and unfortunate murders. These attacks never made the front page of newspapers as it would frighten off prospective travelers on the canalways. But none the less, these dark deeds happened to some unlucky travelers and workers. There were frequent accidental drownings that occurred on the canal as well. Canal boat Captains who lived on the boats had their entire families on board with them. Occasionally one of the children would slip quietly overboard not to be discovered until it was too late. There have been photographs taken of small children tied to wooden stakes on top of the canal boats to help them avoid falling to their watery deaths. Other darker tales surround a specific area of the canal in Stark County. Lock 4 Park is situated one mile south of Canal Fulton on Erie Street. It is maintained by Stark Parks and is a beautiful area to picnic in or to let the kids play freely in the playground area. Glancing around at the canal and park like setting it is hard to imagine anything but beauty at this location. History is not always pretty and what allegedly happened here at Lock 4 in the late 19th century is evidence of that. Many canal workers and boatsmen had gotten word that the railroad was blazing a trail thru the area and that the canal era would be roiling to a close. Railroads could ship people and transport goods quicker that a 4 mile per hour canal boat could ever dream of traveling. Many canawlers became outraged at the railroad companies and all they stood for. Rallies took place and people became desperate as their way of life and income would be affected with the closing of the canal. Local legend says that one worker became violent and grabbed a container of some kind of caustic liquid that was being transported on a canal boat. The enraged worker tossed the lid open and flung the contents on his fellow workers and dumped the remnants on himself. Legend states no immediate deaths ensued but rather a gruesome slower death that took several days. A few men perished due to their acid eaten skin and organs. The man responsible also died. Some claim that if you visit Lock 4 today and that if you listen closely, you can hear the cries and the moans of the men who suffered this tragic event. No documentation has been found to this date to certify this tragedy took place but it has been part of local legend and lore for many years. Many people have confided to me over the years that they have seen shadowy figures while out strolling along certain sections of the towpath. Local newspapers from the 1960s-1970s in Stark County Ohio spoke of this very fact stating that ‘Ghostly Canal Workers Stroll Towpath”. Why would these pathways and waterways be haunted? Many paranormal researchers believe ghosts tend to linger due to a job left unfinished. Could it be the workers continue their ghostly work along the canal? Is it due to the fact that there are numerous unmarked graves gracing the banks of the canal? Another reason that spirits may linger is due to the fact their lives were cut short with a tragic death. Surely the children who drowned falling off of the boats and into the murky canal water would enter this category? For the skeptics I am sure they will be able to reason away any odd feelings along the towpath they may experience. Perhaps the sudden chill is just that…and nothing more. Maybe the feeling of being watched is due to a deer lurking just off of the pathway? Take a stroll along the towpath some day as the sun starts to sink in the sky. I bet you will glance over your shoulder more than once or twice! ** Haunted History Walks of Summersville West Virginia. at the West Virginia Penitentiary since 2006.
and has been a Civil War reenactor for over 10 years. She began creating and leading sold out haunted tours in 2003 in Canal Fulton Ohio which led to developing her own tour company which celebrates it's 7th year in 2011. 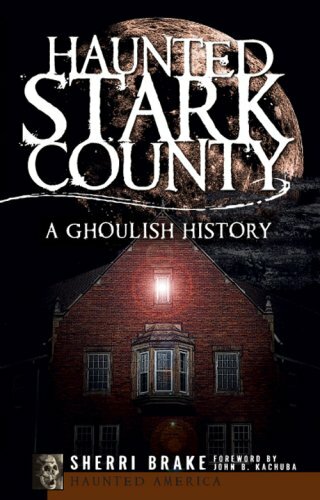 Sherri's first published book Haunted Stark County was published in June 2009 by The History Press. 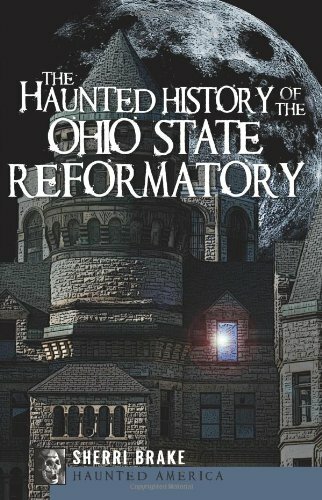 Her second book is "The Haunted History of the Ohio State Reformatory" and was published by The History Press in May 2010. Her third book "The Haunted History of the West Virginia Penitentiary" will be published winter of 2010, and her fourth book will arrive in spring of 2011. Ghostly diners, violent crimes of passion, phantoms peering from theatre balconies, canal workers who still walk the tow-paths the haunted history of Stark County includes characters and legends as bizarre as they are terrifying. Take a bone-chilling journey with Sherri Brake, owner of Haunted Heartland Tours, as she recounts tales of superstitious pioneers and the horrors of the great influenza epidemic of 1918. Stroll along silent corridors of an abandoned asylum and linger among graves of Civil War dead- and discover the eerie ends of Stark County's departed souls. Built on the site of a Civil War camp ravaged by disease, the Ohio State Reformatory first opened in 1896 to reform young offenders but eventually grew to house the most dangerous criminals. By the time the Mansfield institution closed, the prison was hosting one thousand more prisoners than it was designed to hold in "brutalizing and inhumane conditions." Within the dark corridors made famous as the backdrop for The Shawshank Redemption, ghostly presences linger, from the dungeons of solitary confinement to the West Wing showers, where a bent pipe marks the place where a prisoner hanged himself. Venture behind the walls of this notorious prison with ghost tour guide Sherri Brake to discover the history and spirits that forever haunt these halls' if you dare.